Europe is one of the best places to study medicine in the world. With the maximum number of the seats for MBBS in Europe, it has become the first preference of foreign students. Today, it has become one of the best choices of the millions of the young male and female aspirants planning for MBBS in Europe from the top European Universities. Let us know more about Europe. The development in Europe has been beyond the expectation in the last two decade. There has been remarkable growth across sectors resulting in the overall development. Today, people in the European countries are health conscious and give due importance to education. The literacy rate has improved and the modern luxuries have made the lifestyle in Europe colorful. People here enjoy comfortable living and a life filled with joy, adventure and excitement. Students pursuing MBBS in Europe can certainly take the pleasure of the high living standard in Europe. There has been a good percentage of development in the industrial sector. It has helped the locals and students also find the varied source of earning opportunities helping in generating good amount of money. People in Europe are employed in private and government sectors. Good sections of the people in the society are also engaged in running the wide variety of the businesses and thus enjoy life filled with delight. The Medical universities facilitating MBBS in Europe are well-equipped with the hi-tech sound system in libraries, meeting rooms, smart classrooms, internet supported systems, spacious classroom, clean floors, healthy environment, green surrounding, and of course state-of the art buildings. There are sufficient space for practical and workshops conducted from time to time as a part of the MBBS study programs in European countries. The climate in Europe is moderate and suitable for the students coming from the countries experiencing the different weather conditions. The overall atmosphere in the different season is temperate and loved by the students travelling for MBBS in Europe. So there is no need to worry about the climate. It is suitable for all and offers good living conditions. The two major bodies MCI and WHO has recognized the Medical Courses in Europe. It is followed in all the European countries. The medical syllabus is designed under the expert observation of the highly qualified subject matter experts (SMEs) from different educational background to ensure the high quality course curriculum. The approved curriculum focuses on grooming the professional for a better career tomorrow. Therefore, the Indian students are not required to worry about the medical syllabus. Students should go ahead for MBBS in Europe and work hard to complete the course in medicine with good ranking. There are no entrance test results required for getting an admission. In India for scoring an admission into a reputed college, you have to clear their entrance test exam and then you get an admission. However, for MBBS program/courses in Europe your admission is determined on the basis of your performance in the 12th standard. Students who secure more than 60% in 12th standard can easily get an admission in a good college in Europe. Miscellaneous expenses include resident permit extension, text books, health insurance, etc. It is surely true that pursuing MBBS in Europe is reasonable compared to that of India. In India, the entrance examinations are quite difficult, and the competition level is high. Though, this is not relevant in the case of Europe. In fact, the admission system is a lot easier due to which it has begun attracting different Indian medical aspirers. If you go for the same, you can be guaranteed that the MBBS degree that you get will be valid both in UK and USA. If you are getting confused about it, you must choose Study Sevenseas. This platform all set to help you in a great manner to get in top universities. 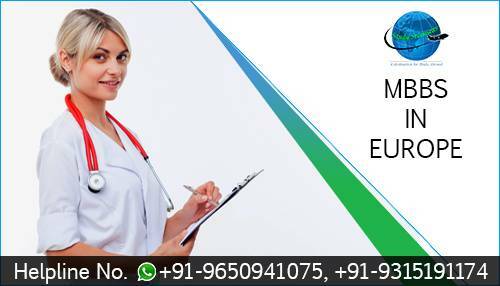 There are a good number of the factors that makes Europe the best destination for the MBBS Program. The career in medical field is the first preference of the modern day youth including males and females. But only a limited percentage of the aspirants are found to be fortunate enough in fulfilling their desire of becoming medical professional. There are certain terms and eligibility criteria that one need to fulfill in order to confirm admission for the MBBS course in a top medical university in India. The percentage of students looking for admission to MBBS in Europe is continuously growing because of the several favorable reasons. The development in the European countries is truly unbelievable across the fields. The standard of education today is matchless and Europe at present has become the favorite destination for the students not only from India but from all over the world. The development in the European countries is truly unbelievable across the fields. The standard of education today is matchless and Europe at present has become the favorite destination for the students not only from India but from all over the world. WHY INDIAN STUDENTS PREFER MBBS IN EUROPE? There is certainly a tough competition in India for the admission to MBBS studies. The number of the applicants applying for MBBS in Europe is more than any other continent in the world. The total number of the seats available for MBBS in European nations is much more than the total applications received every year. Moreover, the total cost of Study MBBS in Europe is comparatively low. As a result of it, students from India are more interested in seeking admission in the MCI and WHO approved colleges in Europe to achieve their dream of completing course in medicines from abroad. Let us understand the important facts playing great role in making students take decision for the admission in the International Universities for the medicinal studies. The applicants in India appearing for the Medical Entrance Test every year is 10,00,000 approx. while the seats for MBBS across the country is 50,000 approx. Thus, the percentage of the applicants in congruence to the available seats for MBBS in India is extremely less. With globalization, the world has become a small family. Now the dream of students will not be shattered because MBBS aspirants can easily seek confirm admission in the top international universities in Europe. There are many advantages an Indian candidate can enjoy by going for MBBS in Europe. We at Study Sevenseas are a trusted Study Abroad Admission consultant recognized as a single destination for the total MBBS in Europe admission solution. WHY GO FOR MBBS STUDIES IN EUROPE? Europe is one of the developing continents in the world. The unbelievable percentage of the growth in the European nations has been attracting visitors from across the globe. Today, candidates from the various parts prefer pursuing the medical course from Europe. There are a many good to know reasons why candidates choose MBBS in Europe. Freedom of thoughts, idea sharing, etc. Listed in World Directory of Medical Colleges. WHY CHOOSE STUDY SEVENSEAS FOR STUDY ABROAD CONSULTING? There is no doubt in the true fact that there are a lot of technicalities involved in the Overseas Studies Admission procedure. But the positive thing today is that there are a number of the experienced consultants engaged in providing Study Abroad Consulting Services to the parents who need the consulting services for the successful admission of their children in the preferred medical universities to study MBBS in Georgia or in other European nations. In the last one decade, the percentage of the candidates planning overseas education has increased tremendously. You will come across many factors that will give you reasons to prefer Study Sevenseas for Overseas Education Consulting. We assure you of memorable experience always. Meet us once before visiting any other Study Abroad Consultants in Delhi for the best from the rest MBBS in Europe admission solution.